Quality is as important to us as it is to our customers. All staff are empowered and encouraged to maintain excellence through quality, to ensure the highest levels of quality are maintained across the company. 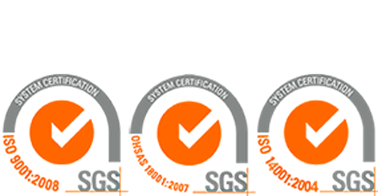 We operate documented systems and procedures to support our aim of total customer satisfaction and continuous improvements throughout our business. •	Clarity in objectives and customer requirements. •	Documented procedures and thorough personnel training. •	Published goals and metrics. •	Actively managed Preventive and Corrective actions practices. •	Regularly scheduled management reviews. •	We regularly measure our Customers' Satisfaction. SAME is committed to maintaining safe and healthy working conditions, minimizing adverse environmental impacts and to preventing accidents and instances of work-related ill health in all activities carried out on company and during the sites visits premises by its employees. SAME Management team and its employees are committed for establishing and overviewing the Company's engagement to manage HSE in accordance with this Policy and for monitoring the performance of the Company with respect to its implementation. •	Comply with relevant HSE legal requirements and other commitments. •	Identify hazards and reduce risks to as low as reasonably practicable where there is potential to cause injury or illness to people, or to adversely impact the environment or the community. •	Supporting the objective of zero Accidents and zero environmental incidents. •	Ensure that our activities are not harmful for health. •	To provide adequate control of the health and safety risks arising from our work activities. •	Prevent pollution by practical actions. •	Support a positive HSE culture and ensure the personnel respect of the HSE regulations. •	Provide information, instruction and supervision for employees. •	Ensure that all employees have the basic HSE Knowledge, and secure adequate training and continuous improvement. •	Ensure the transparency in the HSE reporting. We have the conviction that the knowledge and the compliance with the Health, Safety & Environmental protection rules, are the responsibility of all the personnel, and it is also their responsibility to communicate this culture in their work environment.